I am always intrigued by the 1930s fascination with crinoline ladies - above are two lovely ladies in their English country gardens on two Deco cake stands I bought this week - what was it that the elegant & at times androgynous flappers were seeking amongst all those ruffles, lace & bonnets? 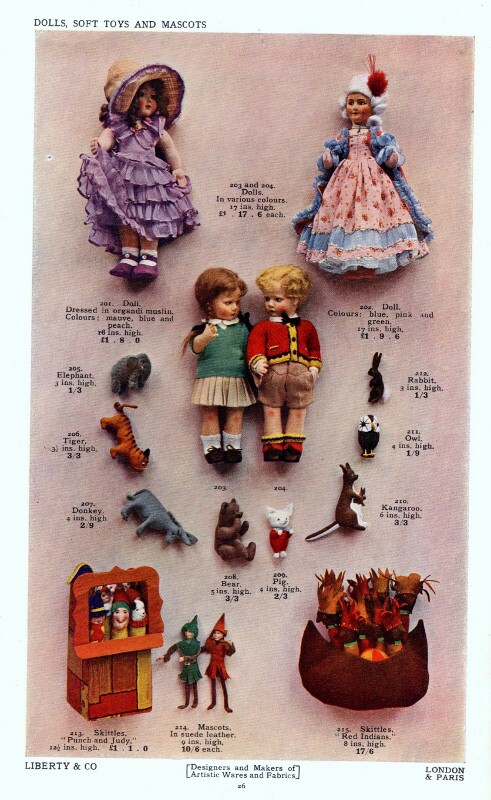 A recent purchase of a 1931 Liberty of London gift catalogue revealed the most exquisitely crinoline attired doll on one of the toy pages. Isn't she just lovely? Whilst on the crinoline theme, a quick revisit to a couple of my recent pics, one from a child's valentine card from the 30s and one from a fancy dress catalogue of the time. Reckon I need to get busy baking some crinoline shaped cupcakes to serve on my new cake plates. in a very graceful fashion towards you before the film started.Or am I the only person who can remember this?